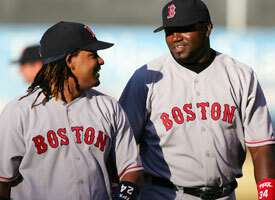 Manny Ramirez deserves (even) more credit than he receives. I admit part of the problem is his propensity for taking a play off here and there. But hey, that's just Manny being Manny. A couple weeks ago, after Ortiz hit his umpteenth game-winning homer and everyone started making "Most Valuable Papi" signs, NESN color man Jerry Remy wondered on-air why teams haven't started intentionally walking Ortiz in critical situations, like they often do with Bonds and other home run threats. The answer is so simple and obvious, it is too often taken for granted; Manny bats next. [Ramirez] has a higher on-base percentage than David Ortiz (.431 to .397); a higher slugging percentage than Ortiz (.619 to .616); he's in the top six in the American League in OBP, OPS, RBI, HRs, walks and slugging. Lately, the best Manny can hope for is to be credited as one half of the "greatest hitting combo of this generation," as he and Ortiz were referred to by ESPN commentators over the weekend. Manny has shown an interest in leaving Boston before. If he starts getting the credit he deserves, then maybe we can keep the "greatest hitting combo" in Boston long enough for Theo's long term plan to come together. By the way, Joe Torre has at times over the weekend opted to pitch to Ortiz and intentionally walk Manny. The Yankees are about to complete a five-game sweep of the Red Sox. Coincidence? Mike Myers is impossible to hit as a lefty batter. Ortiz is now 1-9 vs Myers on the season. I'm one of those who believes that an MVP should have to play every day. DH is not a position in the field, so should be excluded from the MVP race. Manny has been an unstoppable force at the plate in the second half, and he's got a bunch of outfield assists, including a game-saving play at the plate 2 months ago. He definitely deserves to be on the ballot.